In Italy, gnocchi doesn’t require potatoes. They can be made from regular pasta flour, or cheese. In fact, pretty much anything that can be rolled into a lump and served like pasta/dumplings can be gnocchi. In the United States, however, gnocchi is usually assumed to be made mostly from potatoes, though you’ll see sweet potato gnocchi and ricotta gnocchi every once in a while. When it comes to potato gnocchi, there’s a great debate between those who insist on adding eggs to the dough, and those who insist that eggless gnocchi is the best. Begin vegan, this is a problem easily solved. No eggs! There, that was easy, right? What’s really nice about this is that your vegan gnocchi is just the same as a lot of traditional gnocchis out there. While I love adapting recipes to be vegan, it’s really nice to make time-tested dishes that have always been vegan. Gnocchi is one of those dishes. Don’t let anyone make you put eggs in your gnocchi! The downside is that eggless gnochhi can be a bit more fussy than the egged version. But don’t despair! I did a bunch of research, and I think I have a solid recipe here that will minimize if not eliminate any problems. These tips will be detailed in the recipe below. I decided to serve this with two easy sauces. If I’m going to the effort of making fresh pasta, I want sauces that compliment and showcase the pasta–nothing too thick or too heavy that would hide it or mask the flavor of fresh gnocchi. First I made a thyme vinaigrette, but vinaigrette is too strong of a word. It’s simply fresh thyme leaves, mashed in a mortar and pestle with some salt, olive oil, and a tiny splash of white wine vinegar. It’s not nearly as tart as you might expect with a title like “vinaigrette”. It really lets the fresh time flavor stand out, and shows off your beautiful gnocchi. To cut the thyme vinaigrette, I made a simple cashew cream sauce with a hint of lemon. It has a light sweetness and richness that really matches nicely. If you have a high-speed blender (like a Vita-Mix) you’ll have no problems blending the cashews into a smooth sauce. I’m not sure how a regular blender will fare. You could try powdering the nuts in a spice grinder before adding them to your blender, and straining the cream afterwards if it’s still lumpy. It might work fine, though! Alright, are you ready to make gnocchi? And PS – this recipe is soy free! *I call for bread flour because of the high-gluten content. This will help the pasta set up while it’s cooking a little better than regular flour would. Game Plan: The first thing you’re going to do is get the potatoes in the oven. Baked potatoes will be drier than boiled, so even though it takes longer, it makes for better gnocchi. While they’re baking, prepare both sauces, get your workstation ready, and put a large pot of salty water on to boil. 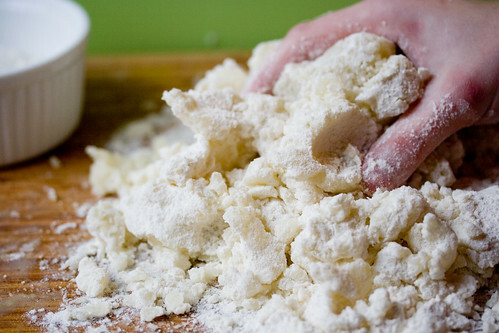 (It’s important that you salt the water and not the dough; this will help keep the gnocchi firm. Salt is hygroscopic, meaning it absorbs water–salt in the dough would make your gnocchi a little mushy). Now you’ll be ready to cook and plate the gnocchi as soon as you’re finished shaping them. For your workstation, you’ll need the following: 1 knife (a paring knife is ideal), a fork or a gnocchi board, a large plate lightly dusted with flour (for your shaped gnocchi), and a large, flat surface for rolling out your pasta. 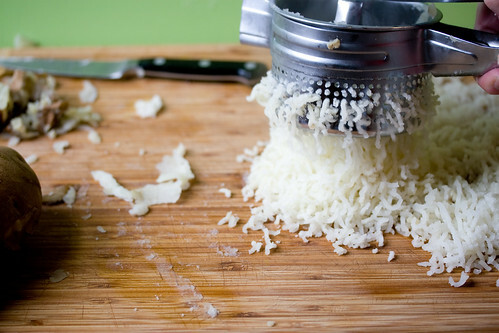 A potato ricer (or a food mill) is ideal for ricing the potatoes, but a box grater or even just a fork will suffice. You want to rice your potatoes as soon as possible when they come out of the oven. The hotter the potato, the more steam comes off when you rice it, which reduces the moisture content of the gnocchi. The dryer the gnocchi, the less flour you need, which leads to the lightest, fluffiest, most delicious gnocchi. Use a kitchen towel to hold the potato, unless you feel like burning your fingers! 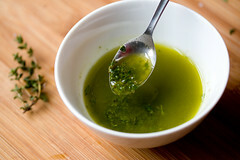 Near your pot of boiling water, place a bowl with 1/2 of the vinaigrette in the bottom. When the gnocchi are finished cooking, you’ll scoop them out of the boiling water with a slotted spoon and place them directly in this bowl and toss to coat. Then you can plate them and drizzle them with the cream sauce before they cool. Got it? Preheat oven to 400º F. Stab your potatoes with a fork and wrap them in foil. Bake in a small dish for about 60 minutes, or until tender all the way through. Meanwhile, prepare your sauces. 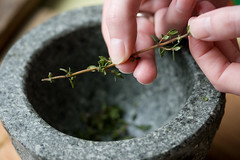 Strip the thyme leaves off their stems into a mortar. Add a pinch or two of salt and grind with the pestle until a rough paste is formed. Add oil and vinegar and mix again. Don’t worry if it’s emulsified, it just needs to be mixed. Taste and adjust salt or vinegar as needed. Set aside. Place all the ingredients for the cashew cream in a blender and blend on high until thick and smooth. Adjust seasoning if needed (this should be slightly sweet and not as salty as the vinaigrette) and set aside. As soon as the potates come out of the oven, remove the foil and then peel them. 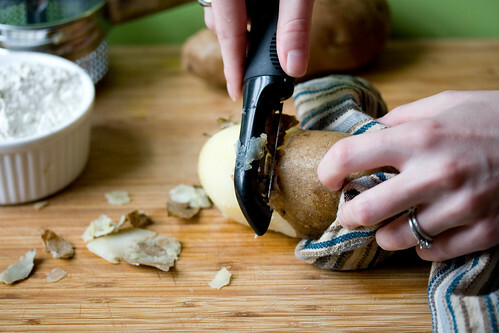 The photo shows me using a vegetable peeler, but I quickly switched to scraping the skin off with the back of a knife. Much easier. Put the hot potatoes through a ricer as soon as you can. The hotter the potatoes are during this step, the better the gnocchi will be. Rice them over a wide, flat surface to maximize contact with the air to help them dry out better. You can also grate them or shred them with a fork. Let the potatoes cool/dry for 10-15 minutes. During this time, make sure you have everything in place you’ll need for shaping, cooking, dressing, and plating the gnocchi. Once they’re shaped you want to be able to cook them and serve them as quickly as possible (unless you’ll be freezing the cooked gnocchi for later). 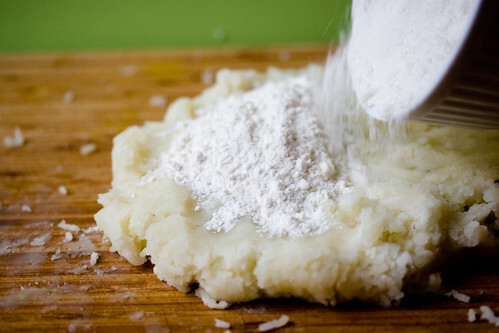 Gather your cooled potatoes into a flat disc and sprinkle about 1/2 the flour over it. 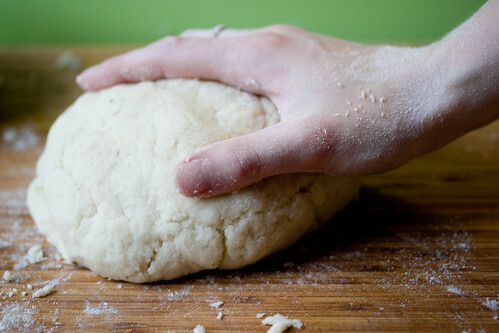 Work the dough with your hands, adding more flour if needed. You probably won’t need the whole cup of flour. I had about three tablespoons leftover. If in doubt, use less as opposed to more. Work your dough until just combined. Do not overwork it! It should be soft, not sticky or crumbly. You’re not even going to really knead it, just mix it together. You must shape the dough immediately. My favorite part! Roll some of the dough out into a long snake, about as thick as your tumb. Cut the snake into little “pillows” and dust them with flour. 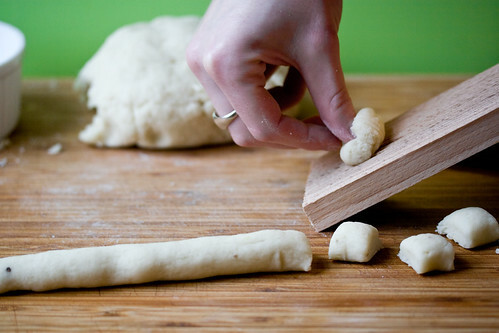 To shape, simply roll one of the pillows down a ridged gnocchi board (or the tines of a fork!). The gnocchi should curl around your thumb. Once side will be ridged, and the other side will have an indent in it. This helps to catch the sauce. 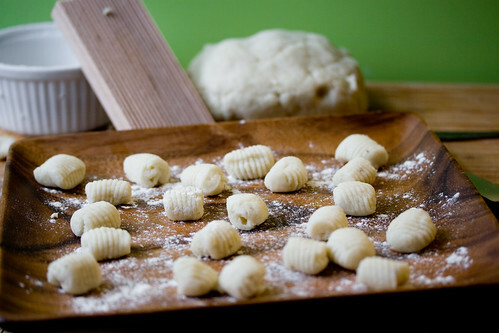 Place the shaped gnocchi on a plate that has been dusted with flour. At this point you should cook the gnocchi immediately. I tried freezing the raw shaped gnocchi and it was a disaster! You must at least partially cook the gnocchi at this point or all your hard work will be ruined. Gently place the gnocchi in to salted, boiling water. After a minute or two, the gnocchi will float to the surface. About 30 seconds after they begin floating, use a slotted spoon to remove them from the water, draining them well. 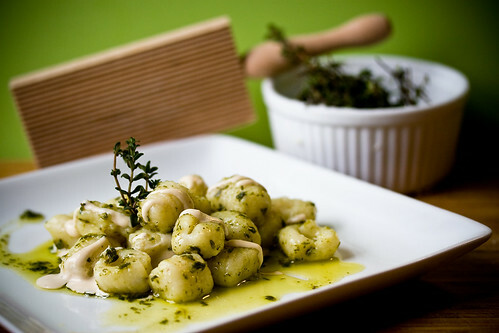 Place the cooked gnocchi into a large bowl that has 1/2 of the vinaigrette in the bottom. Toss the gnocchi to coat. Drizzle your dinner plates with the other half of the vinaigrette and some of the cream sauce. Pile the gnocchi on the plates and drizzle more cream sauce on top. Garnish with a fresh sprig of thyme and serve immediately. This is the second gnocchi recipe I’ve tried. Obviously there’s something wrong with the way I’m doing things, because both times it’s come out like really soggy mashed potatoes. Maybe I’m not putting enough flour in? I love gnocchi, this is so disappointing! 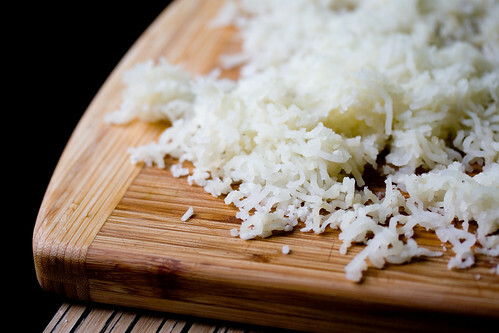 A note about peeling the potatoes: if you’re using a ricer, you don’t have to! Just cut the potato in half and put it in the ricer, cut side down. 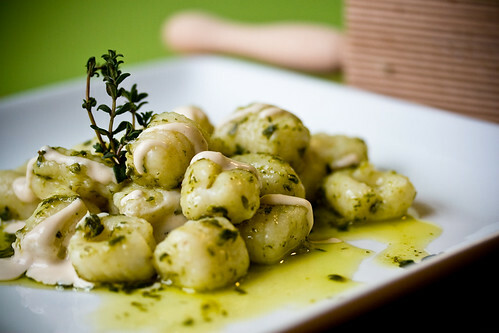 That Gnocchi sounds delicious and the olive oil is calling out my name. Your blog name says it all YUM!!!! I just wanted to say that I freaking love you! And I absolutely can not wait to go downstairs to the kitchen and make lunch… and possibly even dinner! I’ve been in kind of a cooking rut lately… so THANK YOU! You’re recipes look delicious, and I can’t wait to try them, and also, I enjoy you’re commentary. Plus, my big italian family loves gnocchi… but we haven’t had it in a very long time, so I’m hoping they enjoy it! Although I didn’t make the homemade gnocchi, I did make the two sauce recipes to use with some store bought fresh pasta…and the result was amazing! This is the first thing I have cooked from your blog and I’m so glad it turned out so well. Next time I will likely make more of the thyme vinegarette and a little less cashew sauce, I’ve never been a fan of overly creamy pasta sauces, so I ended up having quite a bit of cream left over. I made the sauces to go over some fresh gnocchi and it was delicious! I made the simple addition of mashing two garlic-stuffed roasted plum tomatoes into the pasta/sauce as we ate. So amazingly good. Only two people and no leftovers! A tip for people trying this out: the cashew cream recipe makes A LOT of cream. I halved the recipe and still had a bunch leftover. I didn’t make the gnochhi… yet. I’ve had trouble in the past but am eager to try again. I was very excited to try the lemon cashew cream sauce. I’d been planning to recreate an amazing dish I had at Cafe Blossom in NYC: Baked polenta triangles with sauteed chard, mushrooms and lemon cashew cream sauce. This was a great sauce for that recipe! I DID blend the cashews in my spice/nut grinder first before putting all the ingredients in the blender. It was VERY watery but I heated it in a saucepan and it thickened right up — probably too much. I suppose I could have blended it again but I was too lazy. Also I added salt and lemon pepper to the sauce and it was delicious. I made this for dinner today (tho without the cashew sauce) and it was delicious! Thanks for such a great recipe and thorough instructions! I’ve been making gnocci on the 29th o every month my whole life (Argentina tradition) and tomorrow I’ll try for the first time to make them vegan, to accommodate for a friend. Thank you for the great recipe, I feel confident about it, and I’ll let you know how it comes out! In fact, in today’s world, many ed hardy t-shirts designs are more or less the same with each othre, and ed hardy mens. We did the gnochhi last week and they are outstanding. It was so exciting to make my own pasta! I used fresh basil from my garden, because I couldn’t find any thyme– reckon that was a pretty good move. But I used whole wheat bread flour, and I think next time I would try white bread flour instead. Two Extra Armies Each Turn! August 31, 2009 - 5:55 pm Pingback: The Vegan’s 100 « Earth Muffin ? After I move into my own studio apt (which will still be a while), I am having folks over for food and fun, and this will be part of the buffet! Thanks for this recipe. You share so much with us…, and all is deeply appreciated. Great blog – love following it. I just tried those ones today, but with butter sage… A it time consuming but they were so much better and cheaper than the ones you buy (not even sure I could find them in Sweden anyway). Thanks for your blog, it’s probably the one I use most since I am vegetarian and my boyfriend vegan. It’s a great source of inspiration. Can’t wait to have your book! Damn that cream sauce is delicious!!! Now that I’ve made this recipe, I crave it! This dish is a huge hit at vegan potlucks and once I even made it just for myself :o) Thank you so much for sharing this recipe! So excited to find this recipe. I love gnocchi and miss them very much since I’ve gone gluten-free. I’m going to try this with an alternate flour. Keep your fingers crossed.